One of my daughters’ favorite exhibits at The Brooklyn Museum is the historic rooms, with recreated interiors of Dutch Colonial homes. But they were always upset that they couldn’t go inside them to play. At the new exhibit, Tipi: Heritage of the Great Plains, kids can go right into a giant tipi. Read on to find out more details about this cool new exhibit. At this point in the winter, everyone's list of indoor things-to-do can use a little refreshing. 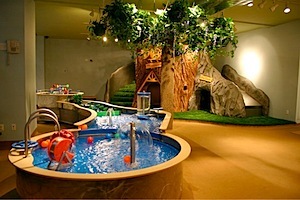 Just in time, there's something new at the Brooklyn Children's Museum. Night Journeys, a bilingual exhibit that itself has journeyed around the country, explores the favorite topic of any parent: sleep. Read on to find out why you and your little one will both enjoy this exploration of sleep, a guaranteed non-snooze fest. As usual, you don't have to travel further than maybe the outerboroughs for some good family times this President's Week break. There's plenty to do right here in New York City, like animated movie shorts, circus events, fun in the parks (even in the cold!) and more museum events than we bet you can handle. And while there is no need to go anywhere else, you could still skip town and try some of our suggestions for fun day trips (even some you can do without a car) in our Travel Guide. There are some cool new and seasonal exhibits going on this February at both the Manhattan and Brooklyn Children’s Museums. From special programs for Black History Month and Presidents Day to a Playmobil toy display, there is likely to be something different from the usual fun for your family to check out if you visit one of these museums this month. Sure, New York City is expensive, but think how much money you save by not having to travel all the way to India with your kids to experience the culture and customs of Diwali. Diwali, the Hindu festival of lights and New Year, is a time to celebrate good fortune, family and friendships. While October 17, 2009 is the official holiday date, there are events and activities for kids to celebrate Diwali in New York as early as this week. Enjoy performances of the story of Diwali, create traditional decorations to take home, eat yummy Indian foods at Diwali Mela street fairs...all you need is a Metrocard and a sense of curiosity. The totally redone Brooklyn Children's Museum is still new enough that we hadn't yet exhausted the current exhibits, but they're staying one step ahead of us by adding a great new exhibit that we really enjoyed, Building Brainstorm. I have always been interested in the fields of architecture and design, and thought this would be a great opportunity to expose my boys to those interests during play. Located on the second floor, this bi-lingual (Spanish and English—love that!) exhibition continues with the interactive theme found throughout the museum, encouraging and inviting children of all ages to plan, build, and design, with rough materials and soft cloths, plastics and wood. The exhibit is made up of a series of challenges: Shape Search Challenge, Shapes in Building Challenge, Inside Shapes Challenge, Window House Challenge, Floor Plan Challenge, Room Design Challenge, and Brainstorm Challenge. Do you check back on posts to read the comments? Sometimes readers add great information there, or ask great questions. Some of my favorites lately were Margaret who asked other readers if they wanted to get a group together for a kids knitting class. Sharon, left a great comment with more ideas of places to eat on the Lower East Side on the Candy Store Itinerary post. Another commenter on our Drop In Play Spaces post asked for recommendations for the cleanest play spaces. Unfortunately due to cutbacks, all of these trolley routes have been discontinued as of 2012. What do the Brooklyn Botanic Garden, Brooklyn Children's Museum, Brooklyn Museum, Brooklyn Public Library, Prospect Park and the Prospect Park Zoo all have in common? They're wonderful NYC cultural institutions that you almost feel guilty for not going to more often (or ever). You know they're great, they're just a little...inconvenient.